For some reason, it is always easy to write a review for a book you dislike. When you have to write a review for a book you love, the words don't come because too much of it is feeling and less of it is tangible though. For a novel you dislike, though, the snark just flows without thought. Unfortunately, this doesn't apply for a book that gutted you, leaving you bitter and disappointed in the end. Just like novels that you hold dear to your heart, stories that upset you leave behind more emotion than what can be expressed with words. As such, I hope you will forgive me for this review. I fear it may ramble, it may deviate from the topic at hand, and it may leave many fans of this series shaking their heads at me. Sorry. I suppose the best place to start at is the beginning. Shortly after finishing Clockwork Prince and giving it 5 Stars, I more-or-less made a decision to not pick up any more of Cassandra Clare's novels after Clockwork Princess. 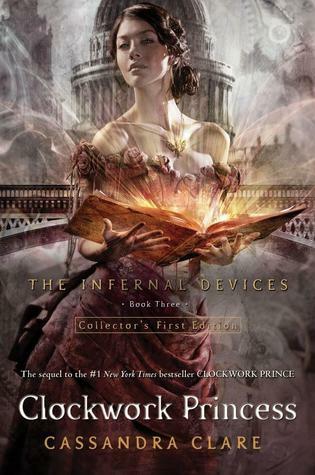 I had read - and loved - the first three books in her Mortal Instruments Series, but after CoG, I refused to continue because I loved the ending of CoG too much and, frankly, could not take the drama. After CP, I began to realize that the majority of Clare's future works were all similar to her previous ones and I was quite convinced that she didn't have too much more to tempt me as a reader. Yet, I was ecstatic for the release of CP2. Like every other fan out there, I theorized and pored over both CA and CP until I was certain that the ending could go only one possible way. Until I was sure it had to play out either like this or like that with no leeway in the middle because, surely, anything else would ruin the series. I suppose then, in some ways, I have only myself to blame for the crushing physical pain I felt after finishing this book. Clockwork Princess disappointed me in the worst of ways. Although it contained Clare's tell-tale wit and humor, her classic writing style that flowed beautifully, and her usual depth of character, it failed to charm me. Objectively speaking, CP2 does everything a good finale should do. It ties up the loose ends alluded to in the previous two novels perfectly, it leaves us without any lingering questions or doubts, and the romantic entanglements are all cleared up. Nevertheless, after the half-way mark of this book, something happened and slowly - very slowly - everything began to fall apart. Although I had cracked open the spine of CP2 and was enjoying it, my mind began to drift after awhile. While everyone else was clamoring about their emotional upheaval, I was reading, calm and cool as a cucumber. After the half-way mark of this book, it began to both get better and worse. What I loved about CP2 was the fact that it shifted to the third-person perspectives of other characters. Although Gabriel, Gideon, Cecily, Charlotte, Sophie, and Henry had always been important characters, they never got their own spotlight to shine in - until now. All of their individual story arcs came together beautifully and CP2 surprised me by giving me a strange amount of emotional attachment to the Lightwood brothers. In fact, if it wasn't for the perfect balance of depth and action that was present within these secondary characters, I suspect CP2 would only garner one star from me. Ultimately, what really went wrong were the characters themselves. It felt as if, all of a sudden, they had all just gone mad. I found myself flipping back to check that I hadn't accidentally pre-ordered some strange new version of Alice in Wonderland where Mad Hatters reigned supreme and was, in fact, reading CP2. Will, Tessa, and Jem are characters we have been with for the past three years now. We, the readers, know them inside and out just as well as Clare herself probably does. We remember their words, their actions, their anguish, their pain. Thus, to have them disregard much of what makes them uniquely them - for them to brush aside certain personality traits and perform actions that they would have normally never performed - was shocking. Clockwork Princess disappointed me because its main characters behaved out of character. If you don't believe me, then just re-read Clockwork Prince and make a list of things that Will, Jem, and Tessa would never do to each other. Actually, just make that list after reading half of this novel. After that, you can proceed to watch as they do all of those actions, which essentially disregarded their respect for each other as well as mine for them. Without giving away spoilers, it is difficult to elaborate on this point any further, but just know that the main characters took decisions in this book that they would have never taken because of honor, respect, and pride. For me, the fact that they made those decisions was surprising more than anything else and, from there on out, the rest of this novel, particularly the ending, seemed too unrealistic for me to wrap my mind around and fathom. Veering away from the love triangle temporarily, I have to admit that I was expecting a little more of a mind-blowing revelation from Clare. Yet, that being said, the ultimate explanations, although not wholly surprising to me, were still satisfactory and the final showdown, despite being one I wouldn't hesitate to label as "lame", was still excellently written. In all things concerned with plot, CP2 does not disappoint. We find out just who Tessa is, what her abilities are, how she came to be, all the manner in which we find out is all very cleverly revealed throughout the course of the novel. As such, the only real complaint I had with this book seems to be the love triangle. For me, the unrealistic actions of the main characters in turn made this love triangle turn out to the way it did. I have no qualms about who ended up with who, but the very fact that it was unrealistic, that the epilogue raised more questions than it answered, that I found myself doubting all the traits I'd pegged on these selfless friends...all that just made me bitter and upset. I will admit, though, that CP2 brings to light the depth of the bond between Tessa, Will, and Jem and, in some instances, this was handled very well and with emotion. For the most part, though, I can't say I was satisfied at all. Maybe I'm a cynic, so I'd warn you all to take my review with a grain of salt. A few. Nearly all of my most trusted friends have loved this and I am thrilled for them - I wish the same on every other reader who opens this book. I hope CP2 is the type of action-packed and emotional ending you all hope it is because, to be frank, disappointment is a terrible feeling. Although I'm done with this trilogy - and with Cassandra Clare, too, I presume, unless she writes something set out of this universe - the joy and love of reading is one I am not finished with. CP2 leaves me feeling as if I should avoid all love triangles - which I will - and all trilogies - which I might - for as long as I live, but I cannot disregard that these characters will stay with me, the way I remember them best, from CA and CP. Beautiful review, Keertana! I just recently finished CP2 and I ended up loving it, but I think you brought up some really good points. It was definitely a little weird for the characters so act differently than how they were in the previous books, but the main thing that left me conflicted was the epilogue. It felt like it was trying too hard to be an ending that would please everyone. And thank goodness I'm not the only one who found the climactic confrontation somewhat lacking. I loved everything about this, even the thing I'm pretty sure you're most upset about, until the epilogue. THAT'S what thoroughly ruined it for me, and while I couldn't force myself to lower my rating too much because of that first part, the fact remains that I was left with a bitter taste in my mouth. It was a total cop out, an unnecessary move, fan service, if you will, and it made everything I felt before somehow less meaningful. BUT, overall, I still enjoyed this very much so I'll just ignore the epilogue and pretend it never happened. *snort* Right. Like that could work. Unfortunately, I have to agree. I still have yet to finish but I am disappointed in these characters. So disappointed. It's frustrating me beyond belief. And this love triangle was so unnecessary. Great review! Oh, Keertana, I am so sorry CP2 did not reach your expectations! That's definitely one of the most frustrating things ever. I have heard that Clare's two series feel derivative of each other, so after only reading City of Bones before this year, I decided to instead go with The Mortal Instruments series. I found plenty of issues I personally had with CP, so I'm not sure if that'll make your disappointments in CP2 more acceptable for me, or if it'll make it even more frustrating. That is interesting though that tons of people have thought the love triangle ended well. I'm kind of hoping for Tessa's death as the resolution...a joke. Sort of. Hah if I've become cynical by book 2, I really am curious about my thought on book 3. Wow you're even harsher than me, I gave it 3 *. It just disappointed me so much. The overly happy ending, the convenience of it all. The Mortmain almost forgotten, the love story taking the spotlight. No real action, everything that happened was just a shadow of what she used to write. I'm not even sure I wanna read Dark Artifices. I'm really sorry that this didn't work for you, Keertana, though I completely understand your reasons why. It must be even worse for you given that you liked the first two books. :( I do recognise your points about the love triangle and the characters' actions, though I guess I loved the rest of it too much to question the faults. I really could have done without that epilogue, though. It's probably the only part that really bothered me. This is a really well written, thoughtful review, Keertana. I am so sad that this book didn't work for you, and though I really loved it, I can definitely sympathize with this feeling in general. I agree that the love triangle was such a big part of the story, at least emotionally, that if you don't love it, it's going to be hard to enjoy this book at all. I do love what you said about all the secondary characters getting their voices. I was pleasantly surprised about how much time they got. And I will agree that the plot in general wasn't hugely surprising, but it was satisfying. I wonder if you would have read this one any differently if you hadn't know the end ahead of time? That's not something that we discussed. Wow, I'm really sorry to see that you didn't enjoy this one :\ I really enjoyed it, but I can see your opinions. Thanks for writing such a well-thought out, insightful review! I'm really glad to read this because I've been seeing so many 5 star reviews that were making me want to give this series another go (I read CA and was given CP but never read it) but now I think I should still with my decision to avoid Clare's books. Great review, I completely agree that it's much easier to review a book you disliked! I'm about 1/3 of the way in and happened to stumble on your blog and decided to read your review. First, thanks for keeping it spoiler free. I was a little worried when I saw how long the post was that I might regret reading it, but not at all. Second, As of right now through this first 1/3 of the book I'm not loving it. I haven't even reached the halfway mark where everything goes downhill for you, but I'm just bored. It's all too much chatting about love or dealing with hidden emotions, and I feel like that's all been covered before. I know everyone's struggling, let's get on with it! But maybe I'm a bit of a cynic as well. We'll see how these next 2/3 of the book go. Either way, great review!